I saw an article on my stepfather Bobby Reynolds posted in June 14 by John Robinson. When I was looking up additional information, I found out that my stepfather started a facebook page in May and he posted a photo of himself and I at the Bakersfield Kern County Fair. Also in this photo is my first live two headed cow that I named Freddy. I found him in Rockdale, TX near San Antonio on my way home from working as manager of the Ringling Bros, Barnum and Bailey Circus World theme park's sideshow in Hanes City Florida. As you can see in the photo, the cow has two separate snouts and a white patch covering two eyes in his head. I had to use the patch because the center eyes did not blink. I also put eyedrops in the center eyes as well. It was ironic how I located this two headed cow. It was long before the internet was made public. I was visiting a doctor, a circus fan, in San Antonio, TX, named Doctor Connover. On the front page of the San Antonio paper was a three month old photo of a two headed calf that was doing well near San Anton. I went over to the farmer and made a deal to buy the calf for $3500. I didn't have a trailer to pull it so I went to uhaul and rented a box trailer and took the doors off the back of the trailer and replaced them with a sheet of plywood to block off half of the trailer to keep the cow secure as I took the cow to California. Now I had this fabulous attraction, but at the time I didn't have a show, banners or quite sure where I'd place it. I remember Bobby Reynolds bought a Holstein cow that weighed like 2500 lbs from Al and Barbara Moody. He bought the two headed cow that was twelve years old. He also bought a barn and a complete show front with this older Holstein two headed cow. 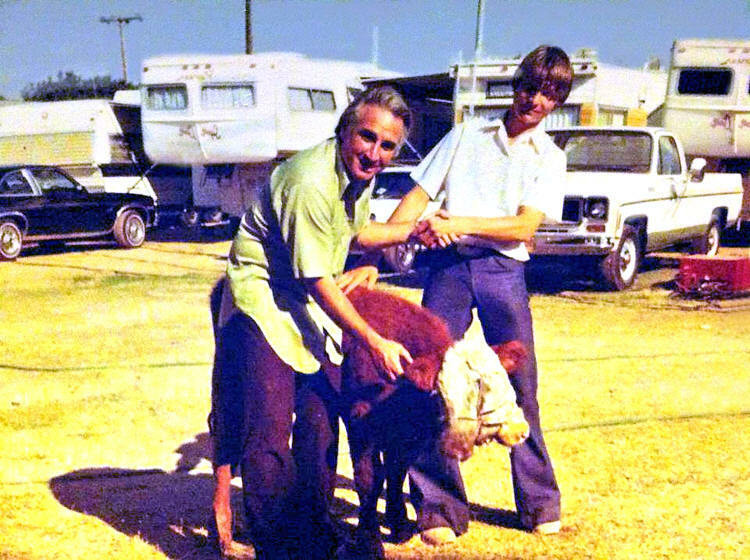 Bobby's giant cow was named King and he only showed it at the Phoenix state fair where it died. Bobby had this very large cow stuffed with its entire body and head. The very next year he showed it again but to add a reality touch he went to the cow barns and got three or four wheelbarrows of manure so that by the aroma people outside would assume that the cow is alive. Hence, since I knew about this cow show, I asked Bobby if a live cow would make more money in a cow show than a dead one. He said great, it certainly will... we'll be partners. I high tailed it to the Bakersfield-Kern County Fair. We added the live cow to the already operating exhibit. We started grossing $1200 a day on the weekdays before the weekends even came! That was 1978. That would be equivalent to a $3600 day today in 2014. Sadly, on Saturday morning, when we gave the cow its two bottles of milk, we found that it had died during the night. Bobby was so distraught that it had died during the night that he gave it cpr immediately to try to revive it. He kept going from the right mouth to the left mouth trying to resuscitate this calf with tears the size of dollar signs running down his cheeks. I had the calf stuffed and mounted by a local taxidermist and used the calf for decades on my own show. That's the story of how I met my future stepfather, the self proclaimed world's greatest showman and how I acquired my first live two headed attraction. From the time I was nineteen to now, I've had over 65 live two headed attractions and over 22 live two headed reptiles from two headed snakes to snapping turtles, tortoises and more all alive. Currently, I have the only live two headed cow in existence. Not to mention two headed babies (real), two headed girl mummies and over 250 stuffed and preserved attractions. Two heads are better than one.